Like most anything else we deal with in our homes, septic tanks will occasionally have problems. Of course, if you keep a proper maintenance schedule of cleaning out our septic tank every 3 years you should be able to avoid the biggest and most expensive problems. So, what are the 8 most common septic tank problems? The most common problems from septic tanks are clogs, tree or plant roots, accidentally breaking the water line or tank through digging, tank leaks, excess water in the tank, non-biodegradables getting in the tank, use of too much detergent and harsh chemicals. Although these are "common" problems, don't be discouraged. There are steps that you can take to help avoid some and/or fix them. We do recommend that you call in professional plumbers to fix most septic tank problems, once they've occurred. Of course there are things that you can do to prevent these problems or at least minimize them but once you have cracks, leaks, blockages or other serious structural problem with your tank or main water line - the best thing to do is to call in the pros to get the condition assessed and corrected. A very familiar problem that we come across with septic tanks are clogs and the backups that occur because of them. A warning sign of a possible clog is if your drains and toilets are slow to and/or you notice sewage backups in your toilets, showers, bathtubs and/or sinks. If you have not been maintaining your septic tank by getting it cleaned out (pumped) every 3 years then your tank may be full and therefore causing a backup. But if you have been keeping to a regular schedule then the issue could still be a clog, it would just more than likely be a clog in the pipe between the house and the septic tank. Again, we recommend that you call in a plumber to inspect the problem. 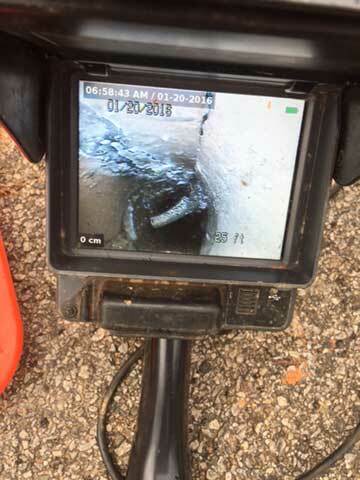 Our Sewer Camera Inspection would be able to identify exactly where the clog(s) are and then we can put together a plan on how to best get that unclogged. 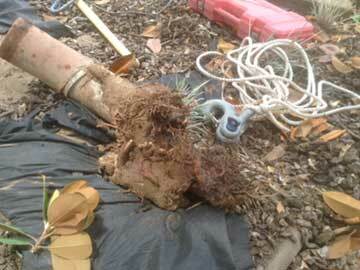 Although tree and plant roots will seek out water anywhere they can during droughts (which we fortunately do not get much of here in the Atlanta area) - the fact is that roots can seek out water at any time and if your water line pipes and sewer tank are nearby - well - you do have a higher chance of them getting "broken into" by these roots. The tips of tree roots can naturally detect the slightest differences in the level of moisture nearby so they are attracted to the warm water flow that is in sewer pipes in your yard. The roots then grow in the direction of that water source and begin the process of searching for a way in to the pipe or septic tank. Of course if this has already happened you will need to call in a plumber to fix the problem. But if you are installing or replacing a septic tank it's recommended to place that tank in a spot on your property that is far enough away from any roots that may invade your pipes or tank. There are times you will be remodeling your yard or perhaps a new cable line has to be laid or maybe you're even digging up some existing landscaping. Whatever the reason, if you begin digging and accidentally hit a pipe or the septic tank and cause a crack - well - not much can be done except to call in a plumber to fix the damage. Ask the previous owner of your house. Septic tanks can leak. Cement tanks can crack if the weather gets too cold. Plastic tanks can develop a leak if they are old enough. Leaks can occur due to rust damage, at the ports connecting pipes to the tank and if the quality construction of the tank is poor. The difficult part is that it's very difficult to identify (easily) if a tank is leaking. Often, it's impossible to know until it's been opened up and pumped out. So, the solution here is to keep to a regular maintenance schedule of getting your tank pumped out every 3 years and you should be able to avoid major problems due to leaks. Of course, if you notice that the ground above the septic tank is soggy or flooded, this is a strong indication that you have a leakage problem either with your water pipe or your septic tank. Please call in a plumber immediately. There are significant health hazards having wastewater and raw sewage in your yard. You may be wondering - how can there be excess water in my septic tank? If the water is not draining out properly due to a blockage or some other issue - your tank could get filled up with water. If you are using your washing machine, your dishwasher, your shower, bathtub, etc. excessively then you may be overworking your septic system - it may not be large enough to handle the workload you are placing on it. The easy solution here is to modify your water usage. Instead of doing 2 or more loads of laundry in one day, do one load of laundry each day. Instead of taking 20 minute showers, take 10 minute showers. Instead of running the dishwasher every single night - perhaps run it every other night. Of course - you make your own modifications depending on your family and your needs but you get the idea. If the excess water is due to a blockage in the piping of the tank, then the best thing to do is to get the tank pumped and cleaned out and of course, get the blockage removed. Avoid putting any of these products down your drains, garbage disposal and toilets. But if they have already found their way to your septic tank, the best solution is to get it cleaned out immediately. So, how can using too much detergent possibly cause a problem in your septic tank? Many detergents use a surfactant - which is the ingredient that gets soil particles off materials. This is wonderful for most of us but that particular chemical is a very harsh contaminant of groundwater and not all septic systems handle it well. Another reason too much detergents can be harmful is that powdered detergents can form clogs in the septic tank. Reason is many less expensive detergents use fillers and these tend to clump up easily. Our recommendation is to use low phosphorus liquid detergents and of course, use as little as possible. Many of us use household cleaners to keep our homes clean and as germ free as possible. But many of these cleaners have harsh chemicals that can be causing damage to your water pipes and your septic tank. Drain cleaners are the most corrosive of all so we recommend that you avoid these, especially if your home is connected to a septic tank. Solvents such as glue, nail polish remover, degreasers, motor oil, etc. are also very damaging to your septic tank. How much does it cost to clean out a septic tank? On average, the cost to clean out a septic tank ranges anywhere from $75 to $300 - depending on what part of the country you live in. Can I pour beer down the sink? There is no harm in pouring beer or wine or any other liquor down the sink. It will not harm your pipes or your septic tank. If you have questions about septic tanks, call the Atlanta plumbers - Atlantis Plumbing today at 770-505-8570. We are available 24 hours a day, 7 days a week.